Black groin guard. Great for Boxing, Thai Boxing, Kick Boxing, MMA. Light groin gruard with elastic waist band. Light and durable, not bulky or uncomfortable. All you need for groin protection. 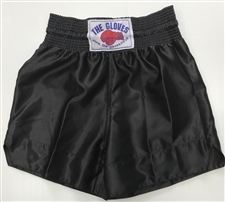 Black boxing shorts. Made of black satin, these shorts are light and comfortable. 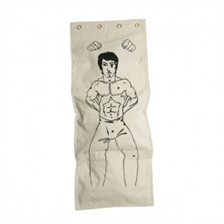 Great for boxing, Kick/Thai boxing. The Gloves Thai Shin Pads. High quality cow hide leather shin and instep pads. 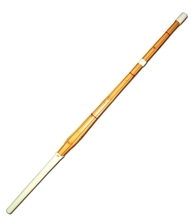 Can be used for Thai Boxing, Kick Boxing and MMA. High durable pads with a nice slim feel, not too bulky. Velcro fastening straps and elasticaed foot strap. Constructed of soft, yet incredibly durable, double-stitched pre-curved premium grade genuine cow hide leather outer shell with triple layer of contoured high-density latex foam inner-core system. Brand new look for this range professional quality gloves, with a whole new appearance & feel, and “Cool-Tec” sign off at the full Velcro wrist strap. Constructed of soft, yet incredibly durable, premium grade genuine cow hide leather outer shell with triple layer of contoured high-density latex foam inner-core system. Brand new look for this range professional quality shin guards, with a whole new appearance & feel, and “Cool-Tec” sign off at the full velcro back-strap. Raised knee area, additional contoured shin ridge, and full foot cover for ultimate shock absorption and additional safety in sparring. Full cover piping, open back design, and soft inner foam layer, for safety and comfort. Double full velcro back-strap closure system with additional elasticated support at the ankle and under-foot for performance, support and ease of on & off. Water repellent non-slip stretch canvas lining. New!!! Circular Coach Pad. Great new cow hide leather coach pad. Great for pad sessions. Two leather handles make it easier for trainers to hold and less impact on joints. Fighther still gets a great workout with a solid pad to hit from all angles.